Selecting the National Basketball Association’s top five players is a matter of general consensus; the players are chosen by NBA analysts, sportswriters and experts alike, yet the bickering continues concerning which players deserve to stand the tallest at the top of the hoopster’s throne. Arguably the best all-around player in the history of the game, Jordan’s 15-year career included averaging over 30 PPG (1st) while helping the Chicago Bulls win six NBA championships. The 10-time scoring leader also amassed 32,292 points, which is currently 3rd on the all-time list. 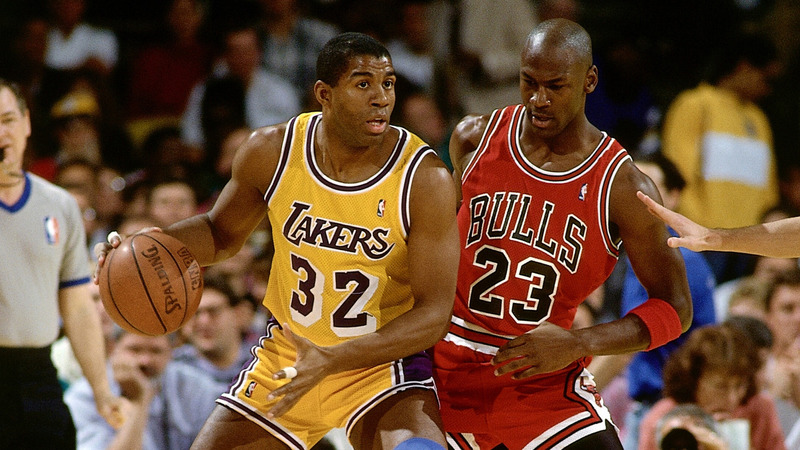 Voted the league’s MVP a total of five times, Jordan ran circles around his opponents. He stepped away from the game after winning three consecutive titles from 1990-93 to play professional baseball for the Chicago White Sox organisation. After returning to the Bulls in 1995, he won three more consecutive titles. Formerly known as Lew Alcindor, Abdul-Jabbar is the NBA’s all-time scoring leader with 38,387 points. After spending 20 seasons in the NBA, he accumulated a half-dozen championship rings and MVP titles to match. His patented sky-hook became virtually untouchable, even against the league’s toughest defenders. Also an 18 time all-star, Kareem averaged over 24 PPG in his time spent with the Milwaukee Bucks and Los Angeles Lakers combined. Inducted into the NBA Hall of fame in 1995, Abdul-Jabbar is a living legend whose bronze statue stands in front of the Staples Center in Los Angeles. William Felton Russell led the Boston Celtics to 11 championships in 13 NBA seasons; no other player has been able to match this achievement. One of the smallest centres to play the game professionally, his 206 cm stature paled in comparison to the big men of the era. Between 1956 and 1969 his athleticism helped the Celts to win eight titles in a row, a record that may stay in the books for years to come. Not exactly known for his prolific scoring abilities (15.5 PPG), Russell’s defensive prowess earned him a spot in the top five, averaging over 22 rebounds per game. The only player in the history of the league to score 100 points in a single game, Wilt the Stilt averaged 30 points while grabbing 20 rebounds per game for nine seasons. During the 1961-62 season he averaged 50 PPG for the Philadelphia Warriors, which still stands as an all-time record. Chamberlain also played on the 1971-72 Los Angeles Lakers team that won 33 straight games, a record that is still in place. He also holds the all-time record for collective career rebounds with 23,924, as well as a dozen other basketball-related accolades. He currently holds the # 5 position on the coveted NBA all-time scoring list with 31, 419 points. Earvin Magic Johnson is known for giving the NBA a shot in the arm while helping his Showtime Los Angeles Lakers win five championships during the 1980s. The all-time record holder for averaging over 11 assists per game also played every position at one time or another, and with exceptional skills. His 14 seasons with the Lakers included three MVP awards as well as nine All-NBA 1st Team honors. His three finals MVP awards against the likes of Julius Erving (Dr. J), Larry Bird, and Isaiah Thomas have secured his position as one of the greatest to ever play the game. It’s also important to note that many other NBA players who are in the game’s top 50 may qualify, depending upon the source. Three of the most notable active players are also destined to land at the top of the pile: Kobe Bryant, LeBron James, and Kevin Durant. Tom is an NBA fanatic based in Brisbane, Australia. He has been actively following and writing posts on NBA and basketball related topics for over 20 years. With this much experience, these are Tom’s top 5 players off ALL time. For local and global fan news, Tom follows www.dunk.com.au for inspiration on hot topics. MJ is the best and no one will ever beat him! I think Kobe Bryant should be on the list too! He’s my favorite!